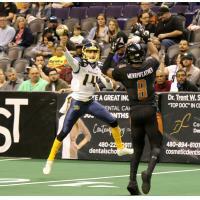 PHOENIX - The Arizona Rattlers (2-0) opened the home portion of the 2019 Indoor Football League (IFL) season in convincing fashion with an 81-37 victory over the Cedar Rapids River Kings (0-2) in front of 14,470 fans at Talking Stick Resort Arena on Sunday. 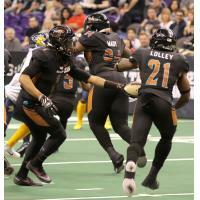 The Rattlers offense exploded for 12 touchdowns on 359 yards of total offense. RB Jabre Lolley led the way on offense with 157 all-purpose yards and six touchdowns. QB Verlon Reed Jr. went 6-of-7 passing for 120 yards, three passing touchdowns and a rushing touchdown. QB Jeff Ziemba came in for the second half and threw for 75 yards and two touchdowns. On defense for Arizona, DL Joshua Gordon had two more sacks and DL Nikolaus D'Avanzo had a sack and a blocked field goal. Rattlers Head Coach and General Manager Kevin Guy liked what he saw defensively where they had to have some offensive players fill in. "We had to bring Holland, one of our offensive line, over to play d-line, we brought Epps in to play some snaps on defensive back in the second half. I was pretty pleased with how they played," Guy said. Lolley has had an impressive start to his rookie season, compiling 10 touchdowns in his first two games. He and Ziemba were teammates at both St. Mark's High School and at Shepherd University. Lolley said Ziemba helped introduced him to the Rattlers in the off-season. "I came out here and it really was a good fit," Lolley said. "I appreciate him seeing something that I can accomplish." For Cedar Rapids, QB Kurt Palandech was 15-of-27 passing for 114 yards, two touchdowns and one interception. RB Nathaniel Chavious had 16 carries for 89 yards and one touchdown. 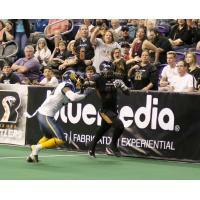 The Rattlers struck for two touchdowns early, thanks to the work of their special teams. Jarrod Harrington returned the opening kickoff all the way to the Cedar Rapids 19-yard line. Two plays later, Lolley scored on a 5-yard run to give the Rattlers a quick 7-0 lead. Following a 50-yard field goal from Cedar Rapids kicker Henry Nell, Dezmon Epps returned the ensuing kickoff for a touchdown to give Arizona a 14-3 lead just 4:03 into the contest. On the ensuing River Kings' possession, Davontae Merriweather appeared to get the ball back on an interception, but a fumble allowed Cedar Rapids to continue the drive. Arizona's defense held Cedar Rapids to another Nell field goal try, which missed wide left. The Rattlers would score again the following drive as Reed found Epps for a 34-yard touchdown pass to increase the lead to 18. The River Kings would get their first touchdown late in the first quarter on a five-play drive ending with a 1-yard run by Nathaniel Chavious. 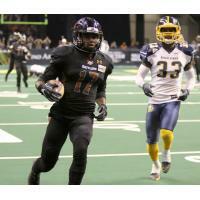 Nell would convert the extra point to cut the Rattlers' lead to 21-10. Arizona would score their fourth touchdown of the period as Reed ran 44 yards for the score. Jimmy Camacho would miss the extra point attempt to keep the score 27-10 at the end of the first quarter. Cedar Rapids would open the scoring in the second as Palandech found Kahri Kimbrough for a 10-yard touchdown pass, pulling the River Kings back within 10. Arizona would tack on another six points on the following drive, a five-play, 45-yard possession capped off by a Jamal Miles 4-yard run. On the following kickoff, Arizona would recover an onside kick attempt. Three plays later, Lolley would score his second rushing touchdown on a 6-yard carry to put Arizona up 39-17 with 6:34 left in the half. The River Kings would answer quickly as Palandech ran the ball 25 yards for a touchdown. After another strong kickoff return by Harrington, Reed would find Anthony Amos for an 18-yard touchdown to give Arizona a 46-24 lead. Cedar Rapids' next drive would get down to the Arizona 4-yard line but the Rattlers' defense would hold the River Kings to another Nell field goal. With seven seconds left in the first half, Reed would connect with Lolley for a 36-yard touchdown pass. The River Kings would start the second half with the ball and drove deep into Arizona territory, but the Rattlers would make another goal-line stand and force Cedar Rapids to turn the ball over on downs. 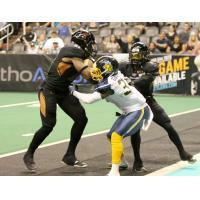 The Rattlers' offense would pick up right where it left off on their next possession. Ziemba would start the drive with a 6-yard run and then followed up with a 41-yard touchdown pass to Amos, putting Arizona up 60-27. Nell would connect on another long field goal, a 43-yard attempt, to cut the Rattlers' lead to 30. Arizona would once again score immediately on their next drive, with Lolley scoring his fourth touchdown of the game on a 34-yard reception from Ziemba. Nell attempted another 43-yard field goal but the kick was blocked and recovered by D'Avanzo. The Rattlers would score to begin the fourth quarter as Lolley ran it in from 15 yards out. The River Kings would get back in the end zone as Palandech found Marquel Wade for a 6-yard score. 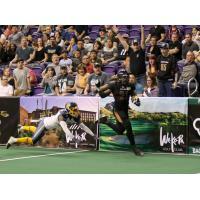 Following a Cedar Rapids penalty that put Arizona at the River Kings' 5-yard line, Lolley would close out the scoring with his sixth touchdown of the game. The Rattlers go into their first bye week and return to action on Saturday, March 16 at 5:00 AZT when they host the Tucson Sugar Skulls. The game can be seen on Your Phoenix CW and on YouTube Live.